If the Fish Die, the People Die. Along the banks of the Sprague River, in Chiloquin, Ore. the C'waam Ceremony is held each year after the first big Fish-Blanket snow in March when c’waam (also known as the Lost River Sucker) swim up the Sprague River to spawn. This years event will be held March 24th. Traditions of the Klamath Tribe state that watchmen or swaso.llalalYampgis were placed along the riverbanks to see exactly when the fish would return. The head “shaman” would then give thanks for their return to the Indian people. The last known shaman to perform the ceremony was Lee Snipes – Captain Sky, perhaps in the early 30’s. The Klamath Tribe celebrate each year with traditional dancing and drumming, a traditional feed, releasing of a pair of c’waam into the river, and other ceremonial practices. The c’waam are provided by the Tribes own aquatic research center. Everyone is Welcome! There are no animals allowed at the ceremony and only approved photographers are allowed to film the ceremony ( The cremation segment is closed to all filming and cameras). Fish known to the Klamath Tribes as c'waam and qapdo are called Lost River suckers and shortnose suckers by non-Indians. These fish were a primary food source for the Klamath and Modoc Indians from historic times until the 1980s when severe declines in the fish populations caused the Tribes to close their fishery. Each spring the Tribes hold a "Return of C'waam Ceremony" as they have for hundreds of years. These fish are of enormous importance to the physical and spiritual well being of the Klamath people. The closure of the fishery has worked a great hardship on the Indian people who have lost this food source. In 1898, pioneer ichthyologist (fish expert) Charles H. Gilbert described the Lost River sucker as "the most important food-fish of the Klamath Lake region." For most of the 20th century, these fish were known as mullet. In 1921, the Klamath Evening Herald ran a story headlined, "Mullets are popular with Indians, white men." It read, "...many people find them delicacies in the truest sense, and prefer them to salmon and trout." White settlers and farmers used mullet for food, fertilizer and oil. The Treaty of 1864 protects the Klamath Tribes' fishery of these species. In 1984 that right was upheld by the Ninth Circuit Court of Appeals in United States v. Adair. 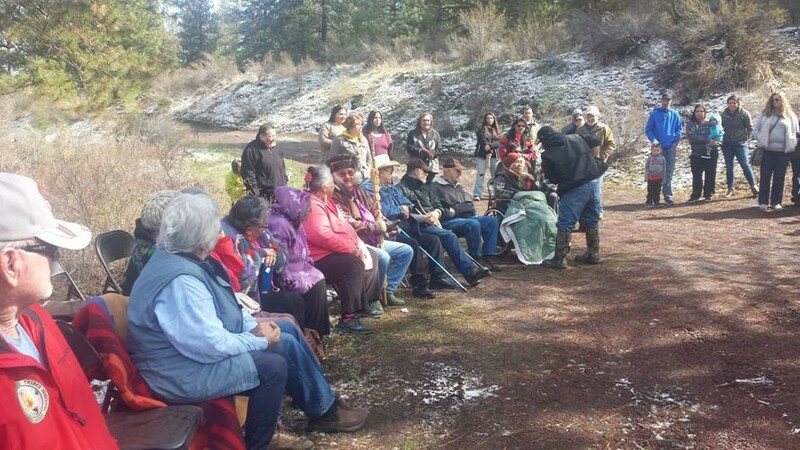 That ruling held that the Klamath Tribes own a federally reserved water right, with a time immemorial priority date, to Klamath Basin waters in a sufficient quantity to support treaty hunting, fishing and gathering activities. Severe population declines in these fish necessitated the closure of the Tribes' fishery in 1986, causing a great hardship in the Indian community and rendering empty the solemn promises in the Treaty. Both species of fish were listed as endangered by the U.S. Fish & Wildlife Service in 1988. Restoration of abundant populations of c'waam and qapdo is a Tribal goal and one key element of the Klamath Tribes plan for restoring the environment and economy of the Klamath Basin. Restoration can be achieved if the Tribes' proposal for repairing the damaged riparian and flood plain habitats of the Upper Klamath Basin is carried out. Restoring the c'waam and qapdo to their former abundance will benefit everyone in the basin, not just the Klamath Tribes and others who harvest the fish. When the fish are plentiful again, restrictions imposed by the Endangered Species Act will no longer be necessary. The habitat restoration and water quality improvements that help the c'waam and qapdo recover will also help restore healthy populations of the threatened coho salmon in downstream Klamath River waters. Press release and images from the Klamath Tribes.